Good morning! I'm thrilled to be hopping today to celebrate the BRAND NEW Simon Says Stamp Good Vibes Release with a FABULOUS line up of talented creators! Today is Day 1 of the hop - make sure and check in tomorrow for Day 2 - there is a $25 prize up for grabs from EACH and EVERY stop along BOTH days of the hop!!! You should have arrived here today from Elena Salo - if you just happened along, head over to the Simon Says Stamp Blog to start at the beginning! You may notice that there is a coupon code above - enter code PUFFY when shopping at Simon Says Stamp to receive those adorable floral stickers! Coupon expires at 11:59 PM on June 24, 2018. I die cut the wheels from black cardstock, and the body of the bike in a combination of Tonic Gold Pearl Mirror Satin Effect Cardstock and Simon Says Stamp Lipstick Red cardstock, then just used scissors to trim and piece together the gold parts onto the red. Fun to layer - and infinite possibilities! I glued those pieces all together, and set them aside to dry, and did some blending on my cardbase with Distress Oxide Inks and my current favorite ink blending tool - the Tim Holtz Ranger Ink Blending Brushes! I have one for each of the color families - and they are SOOO easy to use! LOVE! I added some gold ink splatters to the background with my Starry Colors Palette (my favorite way to add gold splatters right now! ), and once that dried a little, I stamped my sentiment on there using the new Vacation Time Stamp Set. I love this stamp set - so different and unique, and the mix of large and small sentiments is so fun to put together! If you are looking for more inspiration - head over the Good Vibes Gallery on the Simon Says Stamp Blog - full of inspiration with this release! And...when you receive your goodies, please link up your creations as well to inspire others! I also have this card that I posted when the release went live if you are looking for more inspiration - this uses the gorgeous Strangeness Stamp Set and Vacation Time Stamp set for the sentiment (like my card posted above for today!) You can see details HERE if you're interested! Your next stop along the hop is Gayatri Murali - I know she has something fabulous waiting for you - so make sure and head that way next! Love that little multi-color bicycle and the flowers are gorgeous. Awesome cards. Love the new release!! I am in love with that bike! So cute! WOW..that is too cool how you layered up that bike! I can see so many variations to make it useful for different seasons. 4th of July with stars and stripes.. oh, so fun. That bicycle is amazing... I really like how you did this card... That new sentiment set is pretty awesome. I love your ink blending . . . colors that look like summer! These are fun! I love that bicycle, the background is very cool. Beautiful work! I especially like the way you did the one with the bicycle! Wow! Both your cards are totally adorable!!! Colors are amazing!!! I love the Lets Travel Together card! It is sooo stinking cute! Great work! Im very inspired! Beautiful cards, love the cycle one! Oh Heather, your bicycle card is adorable and OH MY GOODNESS, isn't the Strangeness stamp gorgeous? You have certainly done it justice, beautifully done! Love the fun, happy cards! Cute card samples! First one I’ve seen using the bike die. Ok can't hold out any longer, that travel sentiment set is going in my cart. Great cards. I just sent an email to 3 friends with whom I took a really fun day trip last week. 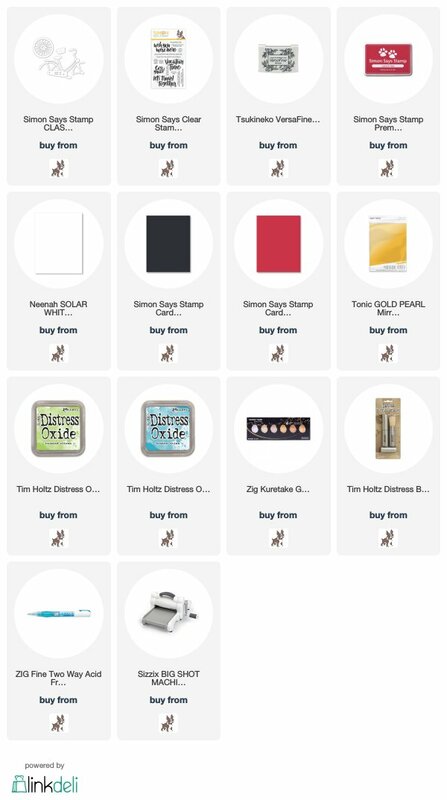 It said that I wished I had that stamp set (etc.) to make them that fabulous bike card. Thanks for putting another smile on my face. Super great cards! The bike card is darling, and I'm in love the floral cards, so soft and beautiful! Wow love the bike! So cute! Such fun creations. Love the soft effect those brushes have. And that giant sentiment is great paired with the bike. Great card using the bicycle die. Must get it! Also love the softness of the flowers on the other card. Love this new release and your cards are so nice! OH wow! I love that bicycle so much!! Need it. Yep. Your cards are just beautiful! Lovely cards! That Strangeness floral stamp is gorgeous! Wonderful cards and a great release. Love your cards the colors are bright but with a softness very nice. Using gold for the trim is a nice touch. Both cards are terrific! Love the cute bike die cut, so many ways to use it on a card! Fun bicycle die! Your flowers are so pretty!!! Great bike it looks so real. Cute cards! The colors you chose for the bicycle die make it seem so real. Who wouldn't love to take a spin on this beauty...Love that sentiment and your colors are perfect. Great cards, I really like this release. That bicycle is SO cute! Fabulous cards! Love this release! Love your beautiful cards. The bicycle die is one of my favorites from this new release. I love both of your cards Heather! The bicycle is adorable, but I'm partial to flowers. Two amazing cards! One fun and one beautiful! Always nice to see different creativity from the same person. Great cards! Thank you for you inspiration! I really love that bicycle card the best! Love your cards. Great job of showing the diversity of this release -- fun and elegant. Something for everyone. Sweet cards! Love that bicycle die! First time I’ve seen the bike, I need that one it’s great! Two lovely cards!! The bike is beautiful and the background amazing!!! Thank you for sharing your lovely cards. Love the backgrounds and the way you colored the flower! GORGEOUS! Love your bicycle card and just love this release. I am definitely going to get that bicycle die. Awesome cards!! I love this bike die!!! Cute cards! The bike card brought a smile to my face. I love that fancy bike you created. Thanks for both cards. The bike is great. The orchids beside the card enhance the beauty of the card, too! AMAZING cards! The Bike one is absolutely adorable! Great bike! I didn't think that die would look that good. Thanks for the inspiration. Great bicycle card- makes me want to ride into the sunset!! These are lovely! Love the bicycle die. Beautiful cards! I love everything in this new release! That bicycle die is awesome! Love your bicycle card!! Great colours! Love the bike card. All the layering and colors, cute. Love this release, you sure make some beautiful cards with the new goodies! Love the color combo of your first card !! Great job with the bicycle card, the pieces came together beautifully. Also like the floral card with the background splatters. I'm in love with those flowers! Such pretty cards.....I LOVE that bicycle! So glad I ordered that. Great release, and love the floral card too! I love these cards - so different to anything else I've seen on the hop so far! Cute card! I love your Strangeness card too!! Nice cards! I am glad you used the bicycle die. It's so cute. I love your cards because they are such different styles. The bike is so cool with the gold and the flowers are beautiful. 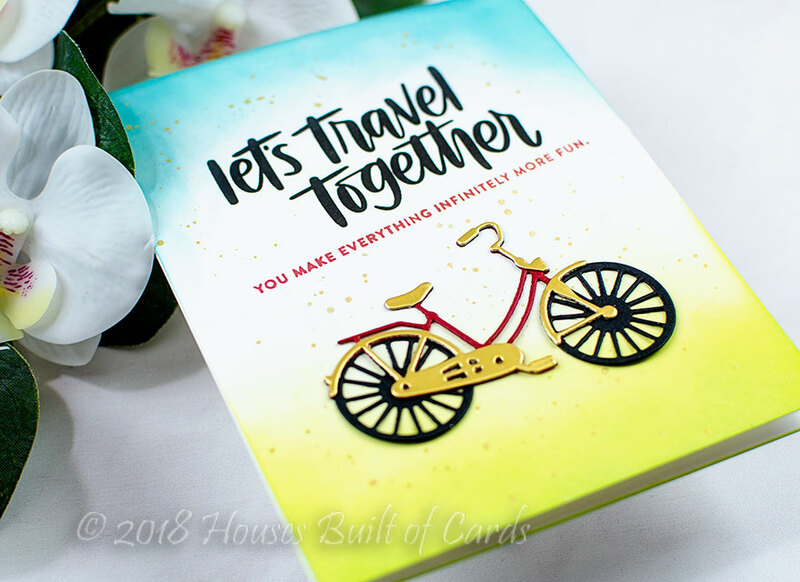 Love both of your cards...what a good travel idea for a friend you love to take along. Such lovely cards! So wonderfully summery and beautifully executed. Terrific cards! Love the travel sentiment. Fabulous cards. 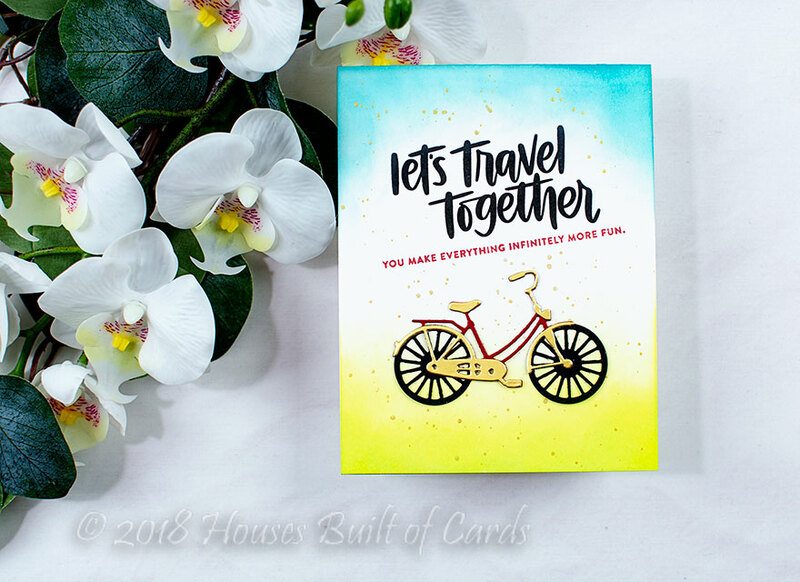 I love the playful bicycle card and the gorgeous floral card. Thanks for the inspiration. So cute! Love the floral card too. I love your beautiful bicycle card!!! These are so fun! Super great use of the new products! What super fun and darling cards!!! The bicycle die is so fun. Thanks for sharing how it can look. Your bike card is so fun...the pop of blue and yellow on the top and bottom really make this card stand out! Very beautiful cards. Love this release! Awesome cards! I especially love the bicycle! Cute and pretty cards. Love that bicycle. Both cards are so pretty. But the floral card is just gorgeous! That bicycle turned out to be so cute! Love it! TFS! Beautiful cards - love your beautiful summer colours. The bicycle card is just lovely. Really love the bicycle card! One of my favorites from this whole hop! Your cards are so lovely. Love the colors in the bicycle card. The flower is amazingly beautiful. Such fun cards, I especially love the one with the bicycle! Great cards, especially the bicycle card. That idea would be perfect for my next girlfriends get-a-way!! I've seen so many great ideas! I love the bike card. Oh, Heather, loving that bicycle card! Your cards are so cute! I love the detail in your first card and the beautiful coloring of your second card! Both cards are awesome. Im a bike rider so thats super cute but the floral is beautiful. Great job on both! Love them both, but the flower one is just beautiful! Awesome cards, Heather! Love the spiffy bike! Awesome cards, Heather! Live the spiffy bike! I love the bike! Really cut die. Your cards are both so different, but both are really beautiful! Both cards are great but I love the Wish You Were Here card a lot! Your cards are great Heather. I love that floral design and the bicycle is just so dang cute. Thanks for sharing with us. Loving that bike and how you customized it, and those flowers are so pretty! SQUEAL!! BEAUTIFUL Card!! I LOVE the NEW Products!! THANKS for sharing and have a FABULOUS WEEKEND!! I love the pop of red on your bicycle. It looks beautiful against that gold cardstock. This is one of my favorite releases from Simon, and I can't wait to play with these designs and some super vibrant colors! 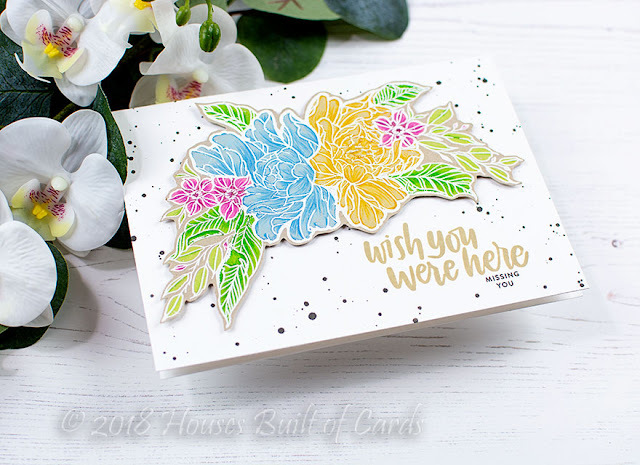 Love the ink splatters in the background of your floral card! Very cool look! What a great card! I love the gold mirrored cardstock you used on the bicycle. Your floral card is beautiful! I wish my splatters enhanced my cards that well! Lovely! Love the bike and colors. Very pretty.. I love anything with flowers. Your cards are so pretty. Love the bike and the beautiful floral design! Fabulous cards! What a great release! The bicycle die is awesome. Cute bicycle card and pretty floral image. Wonderful cards, thanks for sharing. Very hard to resist buying the whole darn collection! Fun bicycle card & beautiful flower card! What great cards. I really like how you did the flowers. on the other card. Fantastic cards. The bicycle is so amazing! I love these! Love your cards! That bicycle is adorable! Thanks for sharing your creativity! Fun. My bike would have to be either tandem or an adult trike (had 3 wheels). Beautiful cards! Love the floral one! Love both of your cards! 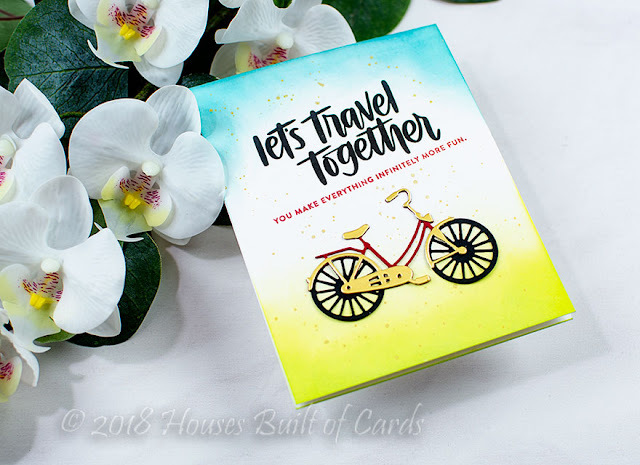 The bicycle card is adorable and the floral card is stunning! Fab cards, love your colouring! 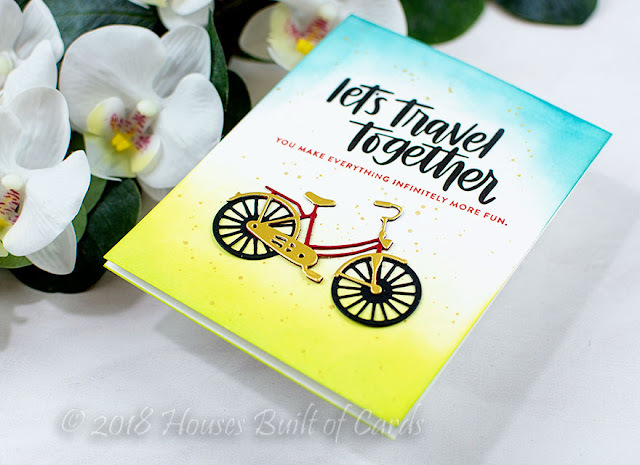 Not only do I love this new bicycle die, but the sentiment stamp you paired it with is fantastic, too!! I really love the cool colors you used to create a "sunny day!" Great card and the floral one is lovely, too! Wonderful cards! I love the golden bicycle, what a fun new die! These are great! Love the bicycle card! So fun! These are so fun - my favourite is the bicycle! The bicycle card is so Summery ! Gorgeous cards! I really like that bicycle. Both cards are really nice but I am drawn to the floral one more. Thanks for sharing. What beautiful cards! That bicycle is so cool! especially your bicycle card, the colors are so happy! Cute cards. My favorite is the bicycle one. The bike is definitely my favorite from the release! Cute card design! The bicycle die is so detailed. I like the colors that you ink blended, such a cute card.